Ea O Ka Aina: Obama - Kill the pipeline! SUBHEAD: Indigenous activists urge Obama to ask Army Corp to pull its permits for the project. Image above: Solidarity protests against the Dakota Access Pipeline are growing around the country. Photo by Peg Hunter. From original article. U.S. Judge James Boasberg said he would make a decision by September 9 on whether to halt work on the controversial Dakota Access Pipeline. "After years of pipeline disasters—from the massive tar sands oil spill in Kalamazoo, Michigan in 2010, to the recent oil pipeline spills in the San Joaquin Valley and Ventura, CA—our organizations and our millions of members and supporters are concerned about the threat these projects pose to our safety, our health, and the environment," reads the letter (pdf), signed by groups such as the Indigenous Environmental Network, the Sierra Club, and 350.org. The letter was published as a federal judge delayed a decision on allowing the construction to continue. U.S. Judge James Boasberg said after a hearing in Washington, D.C., on Wednesday that he would make a decision by September 9 on whether to halt work on the pipeline, amid a lawsuit filed against the corps by Standing Rock Sioux tribal leaders. Pipeline developers last week agreed to pause construction until the decision. "Whatever the final outcome in court, I believe we have already established an important principle—that is, tribes will be heard on important matters that affect our vital interests," Standing Rock Sioux Chairman Dave Archambault II said Wednesday, according to the Bismarck Tribune. If the $3.7 billion pipeline is built, it will transport 500,000 barrels of oil a day past the Standing Rock Sioux reservation in North Dakota and through several rivers—including the Mississippi and Missouri rivers—which supply water to millions of people. It would traverse North Dakota, South Dakota, and Iowa, before eventually stopping in Illinois. Camps have sprung up around the contested area, as the action against the pipeline stretches into its third week, and Amnesty International announced Wednesday that it had sent a delegation of human rights observers to the protest site. Opponents say the project would destroy sacred and culturally important lands and threaten their access to clean water. 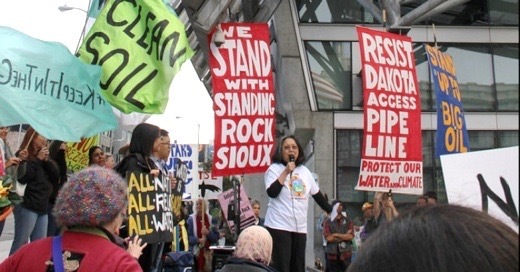 Angela Bevans, an assistant attorney with Sioux background, told the Guardian on Thursday that "[a]ny delay is a win for us, it will give Dakota Access pause and it puts word out that Standing Rock still needs assistance on this." "We've suffered incarceration, massacre and internment. This is just another chapter in the government allowing a private company to take something that doesn't belong to them just because they can," Bevans said. "It's not a matter of whether there will be a spill, it's when it will happen. Everyone knows what is at stake and we won't be sacrificed. We are protecting the lifeblood of our people, these rivers are the arteries of Mother Earth."